When we completed the recording and mixing of the Blues For Allah studio album at Weir's studio, which this album was the maiden voyage for, we gathered up our instruments and equipment and moved to The Great American Music Hall. 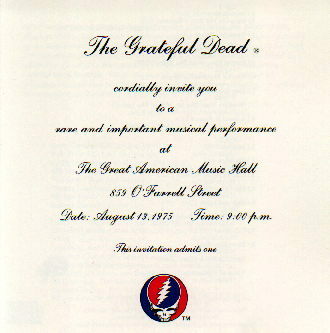 The idea was to perform live to the world, for the first time, Blues for Allah in celebration of not only the completion of the album but also the beginning of Grateful Dead Records. While this performance is one of the most widely collected, not until now has there been a high quality good sounding mix released. This represents the beginning of the release of the vault tapes. Analog: This album was recorded on an Ampex MM-1100 sixteen track tape recorder on August 13, 1975 at The Great American Music Hall in San Francisco, CA. There was no noice reduction or other signal processing used during this recording. Digital: In December, 1990, at Club Front in San Rafael, CA., the sixteen track tapes were played on a Studer A820 tape reproducer and mixed on a Neve Series VR mixing console. A pair of Meyer Sound HD-1 studio monitors were used to monitor the mix. The stereo mix derived from these tapes was mastered onto a Sony PCM-1630 Digital Audio Processor. The PCM-1630 was fitted with an Apogee Filter Enhancement. The Output from the PCM-1630 was recorded on a Sony DMR-4000 Digital Master Recorder using Ampex 467 Digital Audio Tape. A Sony DTA-2000 Digital Tape Analyzer was connected to monitor any errors created by the system. Digital: On January 29-30, 1991, the digital audio master tapes were taken to Oceanview Digital Mastering in Los Angeles, CA., and loaded, digitally, from another PCM-1630/DMR-4000 system into the Sonic Solutions Digital Audio Editor. The editor was then used to assemble the songs into the final CD format, edit time between songs and to move the set break from between Marbles and Around and Around to between Around and Around and Sugaree. These edits were necessary to achieve the proper time per CD as dictated by the CD format. The CD track index codes were also prepared at this time. The final version was then transferred, digitally, back to the PCM-1630/DMR-4000 system to create the final tape from which this CD was mastered. Test CD's were also made at this time from the Sonic Solutions CD Maker. Thus we have an "Analog Digital Digital" or ADD" CD. Every Effort has been taken to preserve the qulity of the original recording and to provide superior reproduction. Album Artwork, c1991 Grateful Dead Merchandising, Inc.
One From The Vault was released in April 1991. It was recorded live at the Great American Music Hall in San Francisco on August 13, 1975. This was the first live performance of both "The Music Never Stopped" as well as "Sage and Spirit."